Looking for Access Control Systems installation - Contact us today! The biggest advantage to access control systems is the ability to grant entry to particular individuals at specified times without having to physically be at that location with said individuals. Access control systems combine hardware and software to control entry points of a secure edifice or property. The system’s capabilities are determined by a series of circuit boards within the access control panel, which serves as the system’s main computer or brain. One of the most common examples of an access control system would be the automated gates at the entrances of closed-gated communities. Most of the time these gates are equipped with readers that can detect resident vehicles through a key card or sticker, placed within the vehicle, that activate the access control system’s proximity reader. 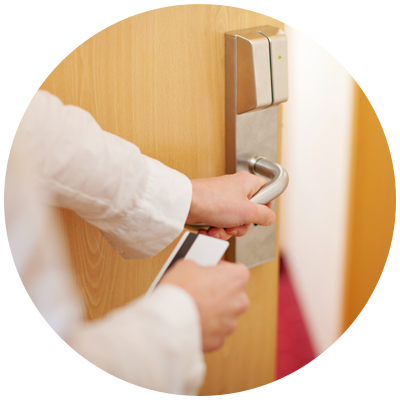 See how one of our access control experts can help you today! Other entry systems include a keypad where you can enter a code for access control, this can be found in various locations such as hotel parking lots, commercial buildings, and increasingly being used to replace traditional front door locks for homes. Techpro Security can help with installations, maintenance, and repairs of high-quality access control systems integrating technological convenience to any entry point of any facility you need.